Since 1769 Debrett’s has been the last word on etiquette and modern manners, providing influential figures and businesses with the social tools they need to make an impact. 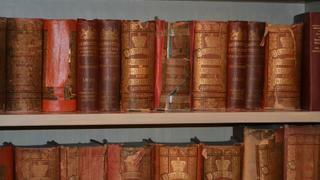 Thanks to its long-running book, the Peerage & Baronetage, a mainstay of founder John Debrett's publishing business for two and half centuries, it is also the authority on the who’s who of British high society. Now in its 150th edition - the first having been printed when the famous sailing vessels of the East India Company ruled the waves - the Peerage & Baronetage will appear one final time in print in 2019 to coincide with Debrett’s 250th anniversary. The only up-to-date reference volume of the United Kingdom’s titled families, the Peerage & Baronetage offers a comprehensive guide to hereditary peers, life peers and peeresses, baronets, and their descendants as well as new members of the royal family, such as Meghan Markle. For easy reference, every living person named can be found in a 140,000 strong index along with a wealth of information pertaining to coats of arms, courtesy titles, forms of address and disused or disclaimed titles. The 2019 edition of the Peerage & Baronetage also includes the Roll of Honour, 1920 - a list of 3,150 people named in the book who were killed in action or as a result of injuries sustained during the First World War. This beautiful act of remembrance sits alongside a series of specially commissioned articles recounting the life of John Debrett and the history of the Peerage & Baronetage along with in-depth insights into royal dukedoms, the implications of modern legislation on titled families and the ancient traditions of succession, offering fascinating reading for historians, genealogists and general interest purchasers alike. 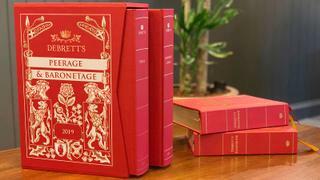 Printed in a strictly limited run of 700 copies, this special anniversary edition of the Peerage & Baronetage is presented in two leather-bound volumes housed in an embossed red and gold slipcase. As the last ever printed version of this storied tome, it is guaranteed to become a collectors item and makes a beautiful gift for yourself or a loved one with an interest in British history. Debrett’s is offering Boat International readers an exclusive 10% discount on the £450 purchase price of the Peerage & Baronetage. Simply enter code BOAT at checkout when ordering your copy from debretts.com.